Different types of MS affect people in different ways. One type is called relapsing-remitting MS. With this type, you have flare-ups of the disease, or relapses. Between these flare-ups, you have periods of recovery, or remissions. During a remission, all symptoms may not improve completely. This leads to worsening with each flare-up. 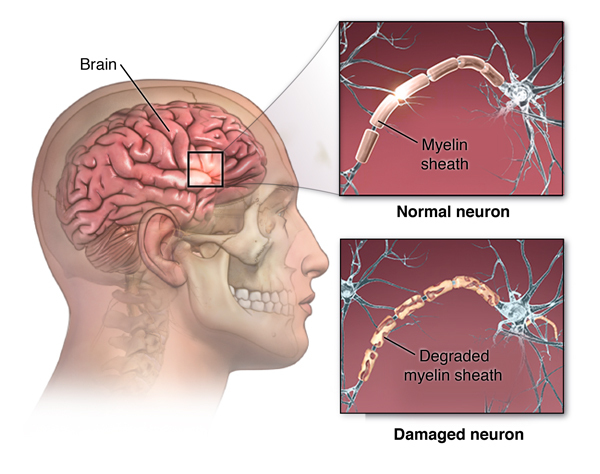 MS occurs when your body’s immune system attacks the central nervous system, damaging the myelin that protects nerve fibers. Experts believe that environmental factors trigger the disease in people whose genetics make them susceptible to MS.
Scientists think MS may be caused by an infection that lays dormant in the body such as Epstein-Barr Virus (the virus that causes infectious mononucleosis). Scientists also think there may be a genetic susceptibility for some people. Cigarette smoking appears to increase risk. Your healthcare provider will also check to see how well your vision, your sense of balance, and other functions are working. You will need an MRI of your brain and spine. This may find areas of damage in your brain or spinal cord that suggest you may have MS. Your healthcare provider may also suggest steroids to reduce symptoms during flare-ups. If steroids are not effective, your healthcare provider may recommend plasmapheresis, a blood cleansing procedure. What are possible complications of relapsing-remitting MS? In most cases, relapsing-remitting MS is mild. But you may need to use a cane or other mobility device. In some cases, the disease is severe and causes the inability to care for yourself. Seldom does it cause death. MS most often develops in people in their 20s and 30s.